Product #21149 | SKU 635962 | 0.0 (no ratings yet) Thanks for your rating! 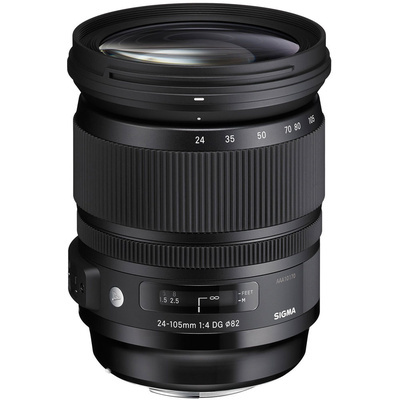 The 24-105mm f/4 DG HSM Art Lens from Sigma is a wide-angle to medium telephoto zoom lens with a constant f/4 aperture. It is designed for both full frame and crop sensor Sony A DSLR cameras. The lens integrates three aspherical elements into its construction as well as two SLD and two FLD glass elements to help minimise aberration, field curvature, and distortions throughout the zoom range as well as provide greater image sharpness while avoiding reduced peripheral brightness. Super Multi-Layer Coating has also been applied to lens elements to reduce surface reflections, lens flare, and ghosting to produce images with higher contrast and colour fidelity. The barrel of the lens is constructed from a Thermally Stable Composite (TSC) material that offers minimal thermal shrinkage and exceptional hardness. For autofocus, a Hyper Sonic Motor (HSM) delivers high speed focus with minimal noise, making it well suited for continuous shooting and video recording. An optimised algorithm offers smooth auto focusing with full-time manual focus override. A brass mount combines high precision with rugged construction, adding durability to the lens. The lens is compatible with Sigma's USB Dock and Sigma Optimisation Pro software for adjusting focus position, and updating its firmware to better suit your needs. The rounded 9-blade diaphragm produces aesthetic bokeh at both large and small apertures.